While orange in home décor is the most misunderstood, purple may be the most feared. However, there's no need to be shaking in those boots. Since there's various shades of purple ranging from very soft to royal bold, you can choose what works best for you. Also, don't think purple is just for bedrooms either, you'll be surprised just what you can do with a living room decked out in purple. Still have doubts? 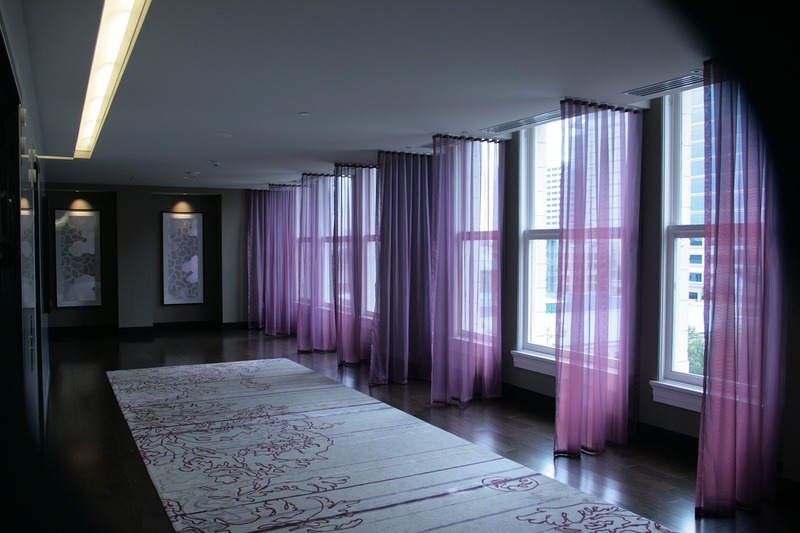 Then, scroll to the bottom of this page to see the collection of rooms decorated in different shades of purple. Start by adding a touch of soft yellow. Why soft yellow? Because yellow is a complimentary color to purple and will help the small amounts of purple you add, to pop. Add the yellow to a feature wall. Then add a lightly pattern neutral drape that contains both the yellow and purple. Keep your couch a neutral color, like white, then add two accent chairs in a medium toned purple (slightly darker). Finish the space off by adding multiple pillows in a combination of the purples and yellow featured in the space. Mix the pillows up with solids and patterns. Start by painting a feature wall in a lighter purple-grey shade. You can paint more than one wall. If you're color-brave go ahead and paint the whole room in that color. Next choose a couch in a solid charcoal grey color, and choose accent chairs that are closer to the lighter grey-purple you've painted the walls. For your drapes, bring in a third neutral color like a light tan or beige. Finally, end the look with pillow accessories but use darker shades of purple on a few solid color cushions and then choose patterns for the others that have both a mix of light purple-grey and tans. So you're gutsy and ready to go all out purple. First choose a deep rich violet purple for a large feature wall. Or better yet, on a fireplace wall. Next go with the same or similar rich purple that you chose for the wall for the couch. 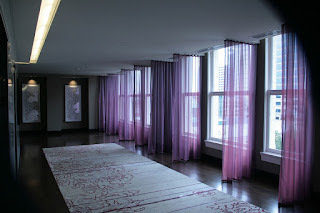 For the drapes continue with the bold theme by using a deep pink-purple. For the accent chairs, you'll need a neutral tone, and believe it or not, a lovely burnt orange will work. Lastly, bring all the shades you've included in the room into various plain and patterned pillows. I like Purple a lot for clothes and decor both. I have pops of Purple in my Blue rooms and I think it looks lovely. I love Amethyst crystals and have them in most rooms so there is a hint of Purple everywhere! Purple is my daughter-in-law's favorite color, so she will especially enjoy this article, Barbara. I'm learning so much about colors with your color decor articles, especially using colors together that I would have never thought about before. Can't wait to see what you do next in your color decor series. Pat, thank you. Purple was my fave color growing up too - my bedroom was purple, pink and white, I especially loved my purple shag rug. Funny, as I've gotten older my fave colors have changed to orange, yellow, then purple and pink. Am so drawn to color! Purple is one of our daughter's favorite colors. When she moved into her first apartment, we painted her office purple. She loved it. In her current home, she has painted the walls grey, but still uses purple as an accent color. btw, I love that introduction photo! 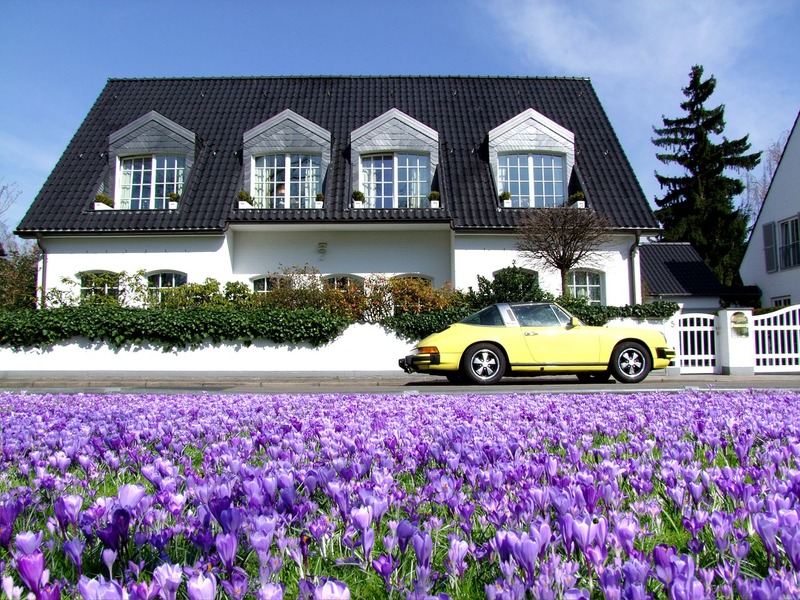 Purple flowers have always been my way to incorporate purple in our home, but I love that yellow car too. What a great picture to illustrate your recommendations. Cynthia, your daughter has great taste :) - pops of purple with grey would look very nice indeed. 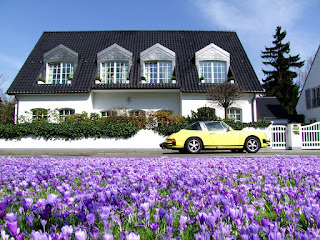 Oh and have to agree with that photo, love the way the yellow car pops against those beautiful flowers too! I love purple, especially love wearing the color, but I can't think of an accessory in my house that's purple! I do like it with yellow and even the orange looks great. Not sure where I'd fit it in at this point, but I'll be considering it for sure. It's funny how we can love a color and not have it in our décor - I'm the same Susan. Purple is gorgeous in clothing; you make me want to shop for some purple clothes.